above: Once seeming to promise much, for many Peter Garrett has failed to shine as a politician. The recent spectacle of Peter Garrett failing federally, and Minster Madden’s current travails in Victoria, highlight a longer term issue that the labour movement and Left needs to wary of - specifically the incapacity of individuals alone to be a catalyst for any meaningful change. And more generally how to achieve reform and change while participating in existing political structures and institutions. Both these individuals seem cut from the same cloth. Both have celebrity status: Garrett as a rock singer in band Midnight Oil, and Madden as a professional sports player. Also, both have previously professed to have held more left wing philosophical positions than their current political affiliations: Garrett as an almost Nuclear Disarmament Party senator in the ‘80s and Madden as an associate and rumoured one time running mate for former left wing independent federal member, Phil Cleary. Both now are the personification of moderate Labor (with the exception of the odd reunion concert appearance for Garrett). For a while there has been press gallery gossip that each saw themselves taking responsibility for more important roles in the future sometime (though Garrett would want to be a patient man in light of recent events), and most importantly neither have been associated with any kind of dissent or alternative agenda within caucus or the broader Labor Party since their arrival in parliament. For this exercise, there is no need to consider the commitment of these individuals to social change (being left wingers we have faith in human nature and we willl give them the benefit of the doubt and assume that they both have “the fire in their belly” still). The real issue is whether or not they, as high profile progressive individuals alone, can be the catalyst for any sort of meaningful change in the direction of the currently cautious Labor governments that they are part of. Unfortunately, the answer to this question is a resounding “no”. What is needed is, first, political education and discussion followed by the dissemination of ideas, with activists engaging party members and supporters through campaigns around achievable goals. In the broader community, any sort of left wing agenda or program is going to be filtered through an increasingly right wing media who owes us no favours. This undermines the process of reform as with a diluted or confused message it becomes more difficult to mobilise supporters around goals and achievements. This is more concerning in a period of declining party membership of left and centre left parties (with the exception of the Greens), breaking the ability of a political organisation to directly contact its members and supporters and mobilise them. Also, all of this can be seen as part of a broader process of ‘presidentalisation’ occurring in Australian politics, where, like America, the media, and therefore the broader community focuses on the one individual, currently Rudd. While the author would not wish to suggest the Prime Minster is not capable of carrying out this solo role (all evidence suggests he is well suited intellectually at least), ultimately this practice undermines the likely longer term success of his government as a reforming government, and creates issues regarding continuity in the wake of his departure. There are countless examples of other left of centre leaders who have variously enjoyed significant personal popularity at times, but have stayed too long - Helen Clark in New Zealand, Tony Blair in the United Kingdom etc. Furthermore, any meaningful process of change will last significantly longer than the period of any one particular individual’s term of office or tenure. It is not unreasonable to assume that any significant programme reform would take a generation to implement and show results (Sweden as an example) in an advanced capitalist society, be it thoroughgoing social democracy or of a more Marxist orientation. Alas, also locally unfortunately, rolling back all of the mad, bad and sad things that the Liberals did in the previous ten years will take a lot longer than one term in the Australian context too. Even a majority of left wing MPs in a parliament, without significant grass roots activity in wider civil society through familiar allies, like the trade union movement and party activists, is unlikely to get far in the context of an advanced capitalist society. Those who favour the status quo have had the opportunity for plenty of practise preserving it. Ultimately, it comes back to creating a political culture of participation, not because we have some predilection towards internal democracy (we should have that too for other good reasons) but because the first step is “getting the message out” and spectators are only ever that - spectating. As the refrain from the classic ‘80s Redskins tune goes "Take no heroes, only inspiration..."
And if you have friends who might be interested in Left Focus - pls consider referring them to the blog; and also to our Facebook group. If we can broaden our readership this way also - without spending on advertising - then it would be so much the better! It is entirely true that our aim should be “political education and discussion followed by the dissemination of ideas, with activists engaging party members and supporters through campaigns around achievable goals”. Regrettably, there is minimal room for it in the Labor Party. Widespread public recognition of that reality is a prerequisite for public pressure on the ALP to itself reform. A very necessary task. We gave seen how the ALP has made very sure that the industrial relations campaigns have run to a very narrow, minimalist agenda. Indeed, the ACTU is a very willing partner in that exercise. During the Kevin07 campaign, a number of union officials were expelled from the ALP at the whim of the Leader, essentially for doing their job well. Forgive me, but “being left wingers we have faith in human nature and we will give them the benefit of the doubt and assume that they both have “the fire in their belly” still” is an inexcusably foolish statement. That “those who do not study history are doomed to repeat it” applies marvellously well to the issue of personal and political standards. It is in the nature of an organisational pyramid that there are very few people at the very top, but that they are the most powerful. It follows that high standards need to be expected of them. Why do we need to give them any benefit of any doubt? What more open and more democratic opportunities for moderate - excuse this much misused word - “reform” is Australia ever like to have? On the balance of probabilities, an extremely reasonable inference is that they are not in any way reformers because they do not want to be reformers in any way. As a recent critic put it, every one of Garrett’s contemporary performances is a sell-out. Why do we need to look to individuals as saviours? To avoid recognising the power of the party structure and the party apparatchiki and agents of influence as a means of suppressing dissent and controlling members’ activities is to adopt a very very inadequate understanding of people in organisations. Such a limited view can only lead to unrealistic expectations, and certainly disappointment. Indeed, the conflict within the Wilderness Society at the moment shows how important it is to recognise the nature of the organisation as well as the individual, or indeed, how disruptive individuals can be. Sadly, there is minimal difference between the ALP and the Coalition. Those times when they vote against one another on the floor of Parliament are virtually front page news. 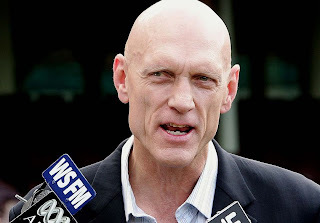 I agree that Peter Garrett did some great work before being a parliamentarian. But being in cabinet has meant he's had to be silent often for the sake of 'cabinet solidarity'. Hence for some he 'has failed to shine'. But I do not intend to bemsitch Garrett's character. I just think he'd be in a better position to stand up - and be seen to stand up - for what he believes in - were it out of cabinet. Of course he might think his contribution in cabinet is worth it - but unfortunately we don't have access to that kind of information. By what standards should we judge Labor personalities? Indeed, what of Labor politicians, other politicians, or the various groups objectively or subjectively deemed to be leftist? Notwithstanding that Greg Sheridan’s Hard Right views, it is difficult to quarrel with his view that “Obama's obsession with his multiracial background is the perfect embodiment of the narcissistic identity obsessions of our age”. So does YouTube and Facebook and Twitter. 2. Within two months a press release (28th of August) stated (“After weeks of playing down claims of waste and mismanagement in the insulation programme”): “Environment Minister Peter Garrett has announced a tough new raft of enforcement measures for the Homeowner Insulation Program, boosting the comprehensive audit program already in place.” Garrett’s department had received 370 complaints about shoddy workmanship. 3. Comparative silence until February, when the proverbial hit the fan, the chooks came home to roost, and the denials boomeranged. Consider also Garrett’s support for uranium mining, effectively support for Gunns’ pulp mill, effective support for Japanese whaling, lack of support for a national bottle recycling scheme, no World Heritage listing for Antarctica, his denial of “green loans” problems, inaction on loss of biodiversity, non-regard of spillages by the offshore oil industry, etc. In his favour there was the rejection of the proposed Traveston Crossing Dam. Like Cheryl Kernot, he is discovering the steadily fading brand value that follows a takeover. Although all ALP members are bound by party discipline, how they exercise their discretion within those boundaries is the true test of their personal standards. My personal view is that Garrett has grossly failed any reasonable test of integrity, let alone leftism. That would of course for par for the course for Labor. While he may or may not politically survive another term, he doesn’t deserve one. We should apply the same standards to all politicians and all parties. It is important to judge people by what they do, not what they say.